Printed Georgette Fabric UK. Custom Printed Georgette Material. Create your own personalised design and select from our beautiful georgette fabrics to print it onto. Lightweight and sheer, custom printed georgette material is perfect for clothing and dressmaking as well as home decor and interiors. Printed georgette material, UK made to order in our London studio, is also great for bridal wear. 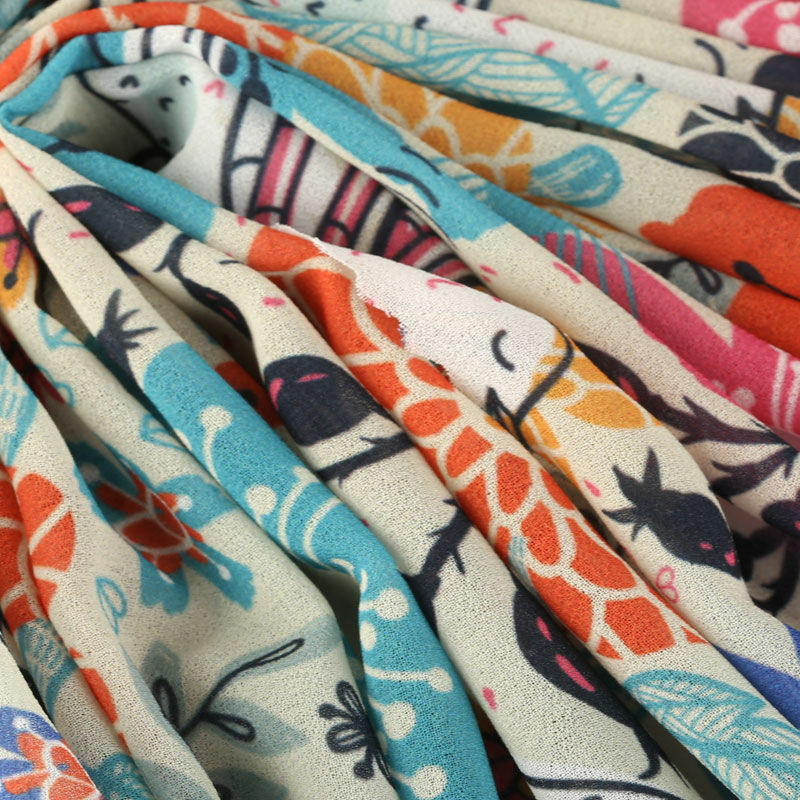 3” printed squares of our entire fabric range, to see and feel the quality. Fine details and sharp lines are printed concisely, and colours are punchy and deep with this custom printed georgette material. Both of our 100% natural silk georgette and our poly georgette are airy, flowing fabrics. Poly georgette uses twisted yarns and a classic crepe face with a georgette weave; as the yarns are twisted, they have a corkscrew effect, which gives the fabric a larger surface area. Poly georgette has a 50% show through to the reverse of the fabric, and the look at feel of traditional silk georgette but is able to be machine washed at 30°. 100% silk georgette is slighter lighter in weight, and has a tight weave of spun yarn, giving it a gossamer appearance. It has 100% show through to the reverse side, and its light, airy feel will sometimes leave the edges slightly wavy, giving every custom printed georgette material its own unique character. We use eco inks for vibrant print and colours come out rich and intense when printed on 100% silk georgette and the fabric is taut all over with only a slight amount of give on the bias. Silk georgette cannot be put in the washing machine but can be dry cleaned or hand washed in cold water with silk detergent. Lightweight and soft, 100% natural silk. Dry clean only recommended, can be hand washed in cold water with silk detergent. Very quick delivery and the sharpness and quality of the large format printer (mouse pad style material) was excellent. Top quality printing, arrived quickly-more than happy! Great service and really pleased with the quality of the fabric I ordered, I most certainly will be using Bags of love again soon. 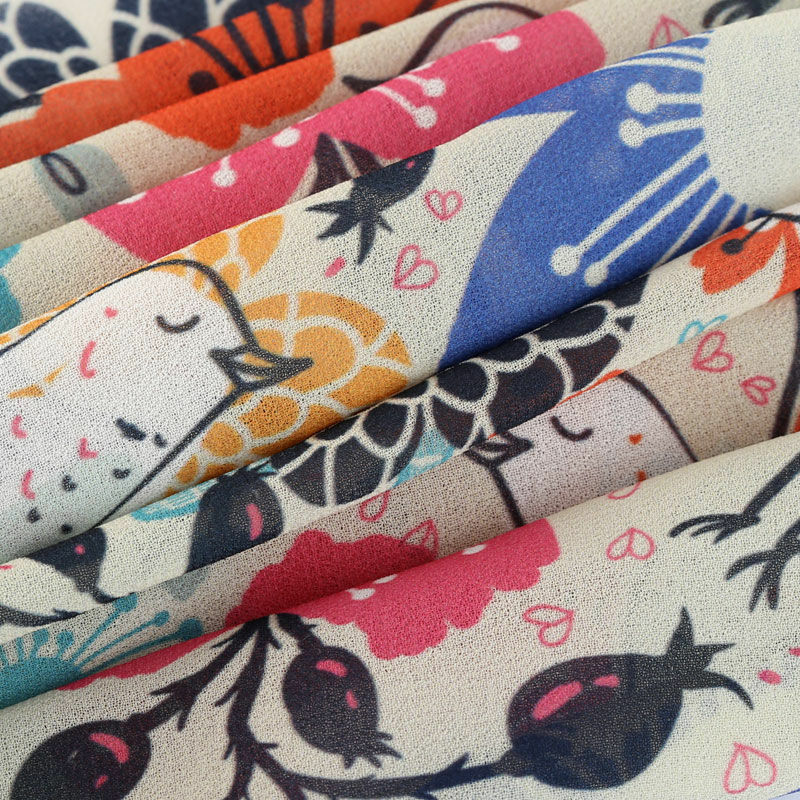 I love that there is such a wild variety of fabrics to print of and colour and resolution are great. Georgette fabric is a fine woven crepe material. It is characteristically lightweight. It is a sheer textile, so the majority of garments made from georgette are lined. It has a fantastic drape and is a fabric which frays easily. Custom printed georgette material doesn't easily crease (poly georgette barely creases at all) and is perfect for bridal wear, as well as dressmaking and home decor such as fine curtains. Georgette gets its name from Madame Georgette de la Plante, who was a French milliner (someone who makes and/or sells women's hats) and dressmaker. Traditionally it is made from silk, however, modern materials can also be used to make georgette fabric, which gives it other properties and characteristics. We offer a 100% silk, and a poly printed georgette fabric, UK custom made right here in our London studio with your personalised design. With Silk Georgette fabric you should expect a fabric shrinkage of approximately 6% on the weft, and 10% on the warp. Once your printed georgette material, UK custom made, has your beautiful design in full colour it can be sent straight out to you. We call this "As it comes" and you'll have a white-edged border around your fabric. You can, if you prefer, choose to have your fabric either "Cut on the Line" so all the white edges are removed or as it is a fraying material, you may prefer to have it hemmed. You'll be given the option of a black or white thread, and either an overlocked hem, which stitches over the edges of your fabric or a two-fold hem with a straight stitch. If you choose to have your custom printed georgette material hemmed, then please allow 6-8 mm on each of the sides of your fabric (12-16 mm in total) for hemming when you give us your bespoke measurements. All fabrics are printed digitally, and when we create printed Georgette fabric, UK made, here in our London based studio, it is no different. There are multiple methods that we use to do this based on whether the material is natural or synthetic. These methods include pigment printing and dye sublimation, both of which will print your personalised design in full colour to your chosen fabric. Natural materials are pigment printed, which is where the coloured dyes are applied directly to the fabric, in a localised way, building the design up. Synthetic materials use our two-step dye sublimation printing. We first print your custom design onto transfer paper, which is then bonded with heat directly to your fabric. 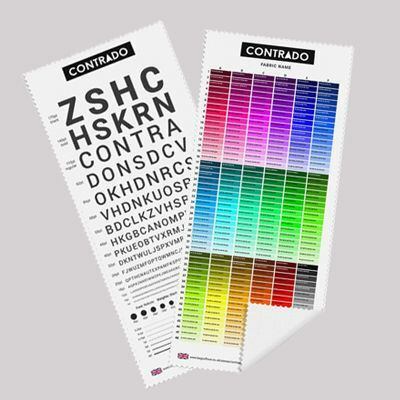 Due to the print process, large areas of solid colour may show minor blemishes or discolouration. This is to be expected and we would advise avoiding large solid blocks of colour if possible.